Application: 1/4'' hexagon insert bits and Wera Series 1 and 4. Drive: 1/4'' hexagon with Rapidaptor rapid-in, rapid-out, rapid-spin, chuck-all and single-hand technology, magnetic. Weras Kompakt tools are suitable for both types of screw-driving process manual and power tool. The bit can be pushed into the adaptor without moving the sleeve. Simply push the sleeve forward to change the bit. The spring mechanism lifts the bit off the magnet and unlocks the tool. The 05013390001 Wera 489 R T-handle Rapidaptor is one of thousands of quality tooling products available from MRO Tools. 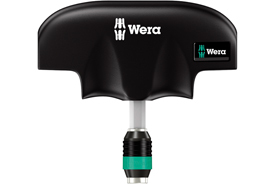 Please browse Wera Kraftform Kompakt and VDE Tools for tools similar to the 05013390001 Wera 489 R T-handle Rapidaptor. 05013390001 Wera 489 R T-handle Rapidaptor description summary: Wera 489 R T-handle. Wera's Kompakt tools are suitable for both types of screw-driving process - by hand or power tool. The handle/interchangeable blade system permits rapid exchange of the blades. Quantity discounts may be available for the 05013390001 Wera 489 R T-handle Rapidaptor. Please contact MRO Tools for details.